Compensations are provided in cases where endangered species cause damage to private property. It is mainly caused by large beasts harming sheep and goats. 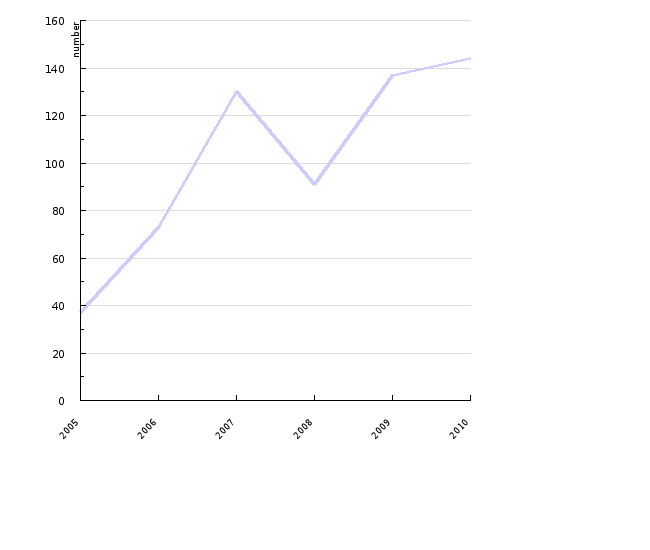 The number of loss events did not increase significantly between 2005 and 2007, but then rose by over 30% in 2008. The total sum of compensations awarded more than doubled in this period. The indicator reflects the damage incurred in a given time period, and the number of loss events where compensation for damage was awarded from the national budget of the Republic of Slovenia. Compensation is granted where endangered species cause damage to private property. The indicator also reports on the implementation of preventive measures to avoid further damage caused by large beasts. Success rate is measured in decrease in the number of loss events, as defined in ReNVPO. Analiza odškodninskih zahtevkov za škodo, ki so jo povzročile živali zavarovanih prostoživečih živalskih vrst, Agencija RS za okolje, 2010; ODSEV, Agencija RS za okolje, 2010. 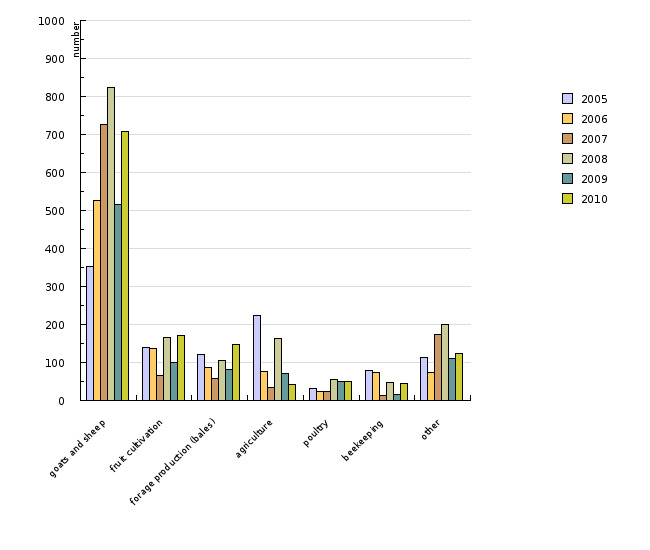 Analysis of compensation claims for damage caused by protected wild animal species, Slovenian Environment Agency, 2009; ODSEV, Slovenian Environment Agency, 2009. 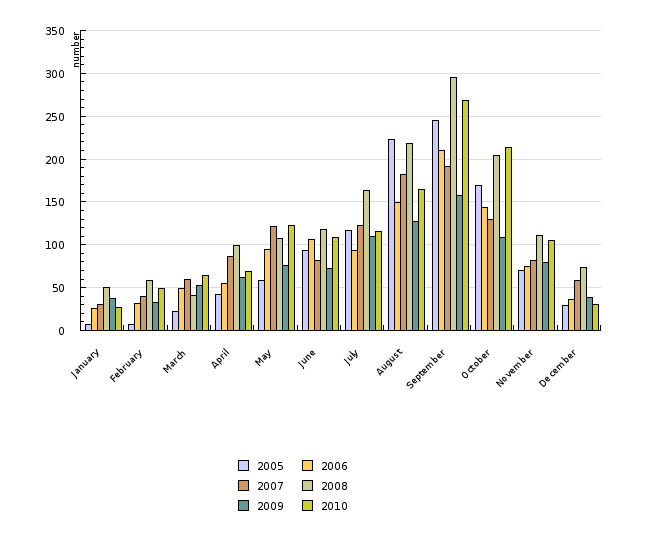 Analysis of compensation claims for damage caused by protected wild animal species, Environmental Agency of the Republic of Slovenia, 2009; ODSEV, Environmental Agency of the Republic of Slovenia, 2009. Final report Public Tender, Environmental Agency of the Republic of Slovenia, 2009. - elaboration of measures for protection of the estate and prevention of further damage. Compensation for damage caused by protected wild animals is based on Articles 92 and 93 of the Nature Conservation Act and on the Wild Game and Hunting Act. The amount of compensation is determined in a scale, which is subject to annual revision and approval by the Minister, and compensation is paid based on claims for compensation by individuals incurring damage. Material facts are examined by officials in charge of damage assessment under the auspices of Slovenian Forest Service. If the applicant does not agree with the compensation awarded, he can apply for a higher compensation if he submits appropriate documentation to justify his claim. Most damage to private property by protected wild animals was reported between June and October. Rejected claims for compensation were also accounted for where the animal causing damage was clearly identified. Claims for compensation were rejected where the relevant legal requirements were not met (e.g. when the property was not adequately insured). 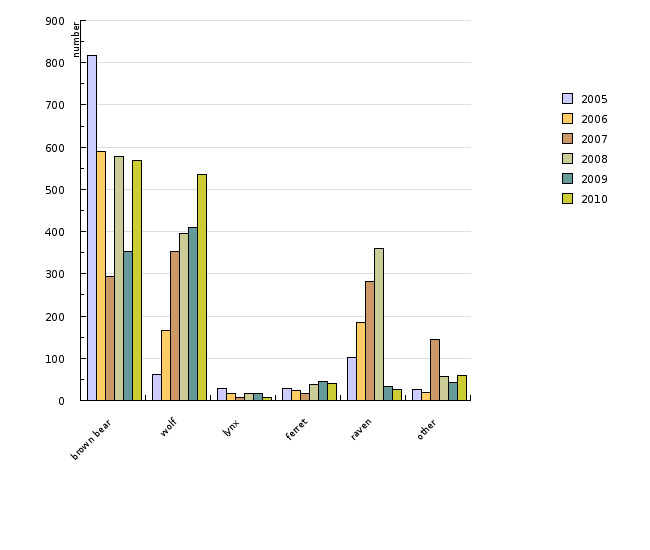 Large beasts (brown bear, lynx, wolf) caused damage in 85% of all cases where damages were awarded in 2005. The number was down to 77% in 2006, 59% in 2007 and 68% in 2008. The brown bear population alone was responsible for 77% of all loss events in 2005, 59% in 2006, 27% in 2007 and 40% in 2008. The wolves, in turn, caused damage in less than 6% of events in 2005, a bit over 16% in 2006, in over 32% in 2007 and in more than 27% of loss events in 2008. In the past 3 years, the number of loss events due to ravens has risen by 15%. 78 to 88% of all funds earmarked for compensation for damage was paid to cover loss events caused by large beasts. 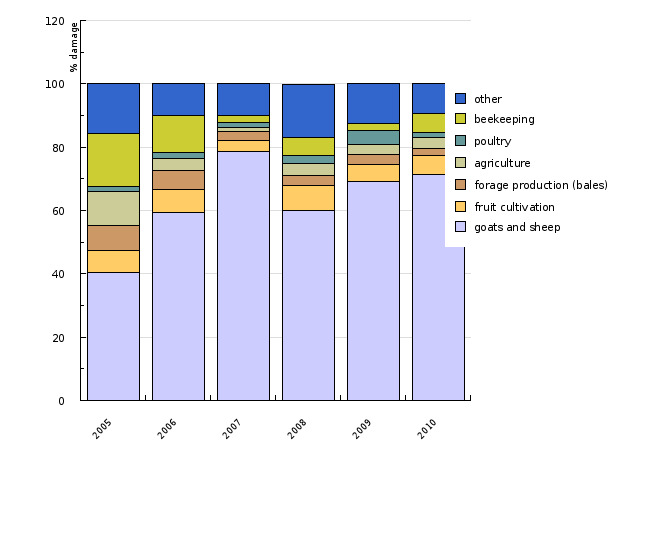 Damage to sheep and goats was done in 33% of loss events in 2005, with the number of occurrences rising sharply in 2007 (to 66%), and then falling to 53% in 2008. 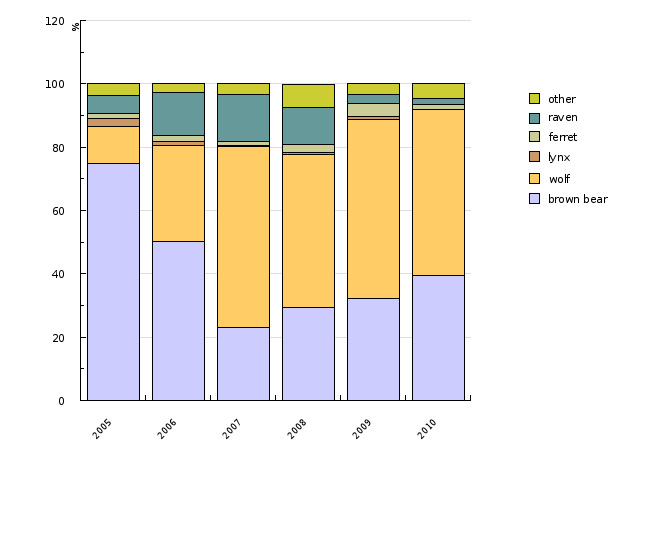 The number of loss events in arable farming is down by 11% in the past 3 years. In 2007, nearly 80% of all funds were earmarked for compensation for damage to sheep and goats, whereas the share of funds awarded for such loss events was 40% in 2005 and 60% in 2008. In the past 3 years, loss incurred by beekeepers has decreased by 10%. Co-funding of preventive measures is based on public tenders for the purchase of electric fence controllers to prevent wild beasts from causing further damage. Public tenders are carried out pursuant to the Rules on the appropriate manner of protecting property and the types of measures for preventing further damage to property. Methodology and frequency of data collection for the indicator: The person suffering damage files a claim with Slovenian Forest Service, authorised officials carry out a land inspection, fill out a report and propose a settlement pursuant to the scale. If the claimant does not agree with the sum offered, a claim can be filed with the Environmental Agency of the Republic of Slovenia to demand higher compensation. Data processing methodology: The Environmental Agency rules on whether the claim and the compensation awarded are justified, and keeps a register of claims for compensation for damage (ODSEV application). The Agency publishes annual reports on the Analysis of claims for compensation for damage caused by protected wild animals, and prepares the final report for the public tender. - Advantages and disadvantages of the indicator: Official data is used as gathered in reports on loss events where damage was caused by protected animals. - Relevance, accuracy, robustness, uncertainty: Data is accurate.